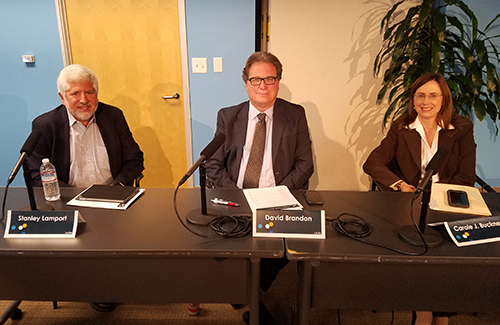 Distinguished speakers David Brandon of Morris, Polich & Purdy LLP, Carole Buckner of Buckner Law Corp., and Stanley Lamport of Cox Castle & Nicholson LLP presented a very important CLE seminar titled Ethical Issues Arising Out of Representation of Title Insurers and Insureds. Many thanks to Vanessa Widener of Anderson, McPharlin & Conners and all participants who contributed to the success of this event! Please join us for this lively discussion of the most important developments, from both reported cases and new legislation, in real estate finance law during 2016 and early 2017. Our panel of experts will include Jennifer Ryan and Ira Waldman from Cox, Castle & Nicholson, Owen Gross from Sklar Kirsh, and M. Scott Cooper from Sidley Austin. Please join us as two experts on shopping center ground leases review the lease provisions from both the Landlord's and Tenant's perspectives. Property owners simultaneously negotiated a refinancing of their home equity line of credit with plaintiff and defendant, and--allegedly unbeknownst to plaintiff--refinanced the first line of credit with a new line of credit from defendant. The ultimate result was that defendant foreclosed and plaintiff took a substantial loss. Plaintiff sufficiently pled a claim for equitable subrogation, which was not barred by the three-year statute of limitations for breach of statutory duty. The applicable statute of limitations was that for an action based on a deed of trust. Defendant--who was sued by a fellow homeowner after submitting an application to homeowners association seeking to invoke the HOA's dispute resolution process against plaintiff for refusing to trim trees blocking defendant's view--made a prima facie showing that the complaint arose from defendant's statements made in connection with an issue of public interest, and therefore the statements were protected by the anti-SLAPP statute. Plaintiff could not show a probability of success on the merits of his claims for wrongful encumbrance and the like, particularly because defendant dismissed his application shortly after the lawsuit was filed and never sought to invoke the HOA's tree-trimming process against plaintiff. State political subdivision lacked standing to challenge federal regulation that plaintiff believed might preempt certain taxes and fees plaintiff assessed against non-Indians who leased lands within an Indian reservation. The regulation did not purport to change existing law, and therefore, did not itself operate to preempt plaintiff's charges, and did not command plaintiff to modify its behavior by doing or refraining from doing anything, so plaintiff had not suffered a cognizable injury at the hands of the government. Court of appeals lacked jurisdiction to issue a declaratory judgment that plaintiff's charges would survive a preemption challenge under Supreme Court precedent, because the dispute between plaintiff and the government was over. United States impliedly reserved appurtenant water sources, including groundwater, when it created the Agua Caliente Reservation in the Coachella Valley of California. Winters v. United States (1908) 207 U.S. 564, which holds that federal reserved water rights are directly applicable to Indian reservations, does not distinguish between surface water and groundwater. Creation of the Agua Caliente Reservation carried with it an implied right to use water from the Coachella Valley aquifer. State water rights are preempted by federal reserved rights. Fact that tribe did not historically access groundwater did not destroy its right to groundwater now. Tribe's entitlement to state water did not affect the analysis with respect to the creation of the tribe's federally reserved water right.